Handel’s Messiah, John Toland and the fight against Deism. 2 Another is the Words, which are all Sublime, or affecting in the greatest degree. 3 a Third reason […] T’is there is no Dialogue […] in this Piece the attention of the Audience is Engag’d from one end to the other […] Many, I hope, were instructed by it, and had proper Sentiments inspir’d in a Stronger Manner on their Minds. John Milton is most famous today for his epic poem Paradise Lost, a poem that was almost lost due to the cause of Milton’s fame (or infamy) in 1660: his work writing defences of the Commonwealth against Royalist attacks. These were written when Milton was Secretary of Foreign Tongues to the Council of State from 1649. The works included Eikonoklastes (1649, justifying Charles I’s execution) and The Ready and Easy Way to Establish a Free Commonwealth (1660, arguing against the Restoration). After the Restoration, Milton had to be hidden by friends: he eventually was arrested and held in custody for a few months. Friends in high places worked to ensure he was included in the Act of Free and General Pardon, Indempnity and Oblivion. Their success meant that Milton was released from prison, allowing him to complete his half-finished epic poem 1. Milton had first come to attention as a poet. His first published work was Lycidas, an acclaimed pastoral elegy written for Dorothy Moore‘s brother Edward King. It’s likely that Dorothy Moore met Milton at some point, though as far as I’m aware there is no record of it. In the 1640s Milton became acquainted with members of the Hartlib circle, including Samuel Hartlib, John Durie, Henry Oldenburg and Lady Ranelagh. Milton and Hartlib probably met in 1643 and in 1644 Hartlib circulated Milton’s tract Of Education, To Master Samuel Hartlib2. 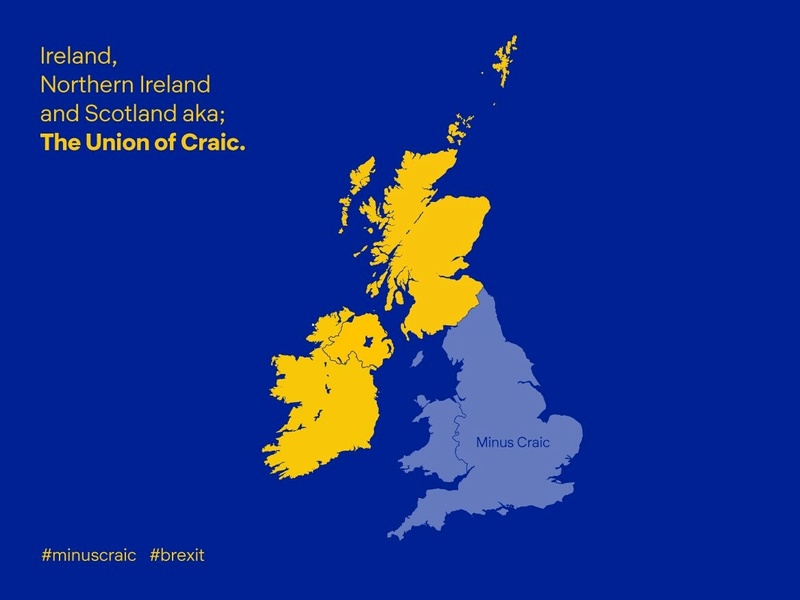 This image of the Union of Craic reminded me of Michael Brown’s opening to his political biography of John Toland. Inishowen is isolated. A promontory on the northern reaches of the Donegal coast, located on the north-western corner of Ireland it is a remote peninsula which seems removed from the concerns of wider Irish, let alone British politics. With the support of powerful men he met through Molesworth, Toland published editions of works by republican authors including Edmund Ludlow, Algernon Sidney, John Milton and James Harrington. Republishing the thought of those associated with regicide was, unsurprisingly, controversial. Toland claimed to be merely laying out these ideas to a free public to be judged. However the truth was more complicated. Collaborating with others to obtain and organise the texts, Toland shaped them to suit the needs of the radical Whigs. His preface to Oceana reiterated Molesworth’s contention that the English government is, under William, “already a commonwealth”. He purged the militant puritanism from Ludlow’s memoirs, silently added original material to the editions of Sidney and Harrington reflecting contemporary concerns, and wrote a life of Milton to shape how the accompanying works were read. He also wrote defending Milton’s denial that Charles the First was a martyr. Though his editorial work Toland created a narrative spanning the seventeenth century in which virtuous republican heroes battled absolutism, arbitrary government and clerical powerseeking. Toland became the myth-maker of English republican theory. The text of a testimonial given by the Franciscans of Prague to John Toland, taken from A collection of several pieces of Mr. John Toland (1726) edited by Pierre Desmaizeaux after Toland’s death in 1722 (on Google Books). This testifies that John Toland came from a honest, noble and most ancient family from the Innisowen peninsula. There were many rumours about Toland’s background, including that he was the illegitimate son of a priest. 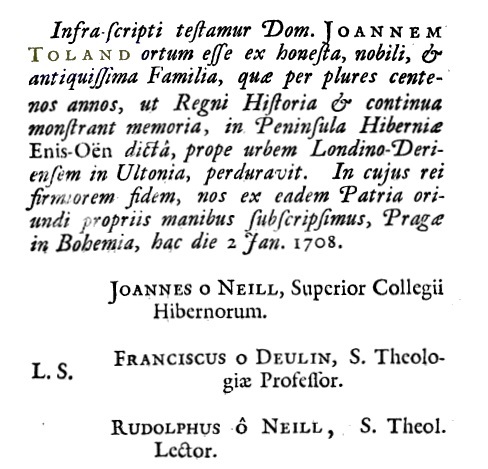 John Toland visited the Irish College in Prague in 1708 and met Francis O’Devlin (the second signatory above), renowned for his work in the Irish language. The college itself was founded in 1629. Its first superior was Patrick Fleming, mentioned previously in connection with the Irish colleges in Leuven and Rome. He, along with fellow-Irishman Matthew Hoar, was killed on 7 November 1631 by Calvinist peasants while fleeing a threatened attack on Prague in the Thirty Years War. More on the Irish College in Prague is in the Irish Times today (Andy Pollak, 28th April 2015). Surprisingly the College library contained a work by Toland: his edition of the works of English republican James Harrington Oceania. Infra scripti testamur Dom. Joannem Toland ortum esse ex honesta, nobili & antiquissma Familia, quae per plures centenos annos, ut Regni Historia mostrant memoria, in Peninsula Hiberniae Enis-Oën dicta, prope urbem Londino-Deri in Ultonia, perduravit. In cujus rei firmiorem fidem, nos ex eadum Patria oriundi propriis manibus subscripsimus, Pragae in Bohemia, hac die 2 Jan. 1708. ‘You have often said it indeed, but yet proved nothing, unless saying a thing is so be proving it to be so’. This annotation was not enough for him; Marsh was the one who commissioned Peter Browne to write a response, published as a A letter in answer to a book entitled, Christianity not mysterious as also, to all those who set up for reason and evidence in opposition to revelation & mysteries published in 1697. The very oldest texts in any language written in Ireland that have survived relate to St Patrick. One, the Confessio, outlines his own account of his life. To the modern reader, it may seem sparse. There is no mention of Pascal fires, of shamrock or of snakes. The tale of St Patrick developed over time, and to fulfil different purposes. Muirchú’s Latin Life of Saint Patrick, compiled around the year 680 which includes tales of wonders, was written to confirm Armagh’s pre-eminent place in the Irish Church. Patrick was said to have arrived in Ireland in 432AD to undermine the earlier Palladius who was documented to have arrived in 431AD. The development of the myth continued into the 15th century, with examples to be found in the Book of Lismore and the Leabhar Breac. This tradition emphasised St Patrick as a wonder worker and a prophet. At the same time secular writings such as the 12th century Acallamh na Senorach include stories of Patrick meeting the Fianna. The Norman invasion saw a parallel tradition emerge, starting with Gerald of Wales’ outline of Patrick’s life in Topographia Hibernica, which included a debunking of the legend of the banaishment of the snakes. Jocelin of Furness’ account, based on resources some of which are now lost, was written as part of the Anglo-Norman attempt to appropriate the saint. Written at the same time as the shrine in Downpatrick was established, it portrays Patrick as a miracle-working prophet, whose mother was related to St. Martin of Tours. Intriguing. But even if texts were not available in European languages, there were certainly people from the Indian subcontinent in London, notably Lascars serving on ships from India. He had also spent time in Holland which also had links with East Indies. Might Toland have learned this though word of mouth?